Despite sounding like a 'harsh' title for a feature with accusations flying all over the place, the actual feature is actually far from that. It features two serious long-time Saturn freaks. One from Holland, one from France. One running Segadatabase, the other running Satakore. Both extremely interested in all things Saturn related. Games, demos, prototypes, magazines, merchandise and always after more information and facts. Both running a Youtube channel, both scouting Yahoo Auctions on a regular base to find the treasures that time forgot. Methinks it's time to talk! -When did you come into touch with the Saturn? S.F: A store in the next town had a Saturn demo pod at launch. I remember laughing at the silly Virtua Fighter voices and it didn't really impress me all that much. A friend of mine got a Saturn in 1996. At the time I was still playing my Megadrive and its new releases (Mortal Kombat 3, Sonic 3D etc). After seeing games like Panzer Dragoon Zwei and Sega Rally I knew I'd have to get one a.s.a.p. I would've loved to get the system earlier but at roughly 400 euro it was waaaay out of my range, being 14. In early '97 prices dropped and I was able to buy a second hand unit with Virtua Cop and Street Fighter Alpha, Worms followed soon after. I bought roughly 15 new games in the next year. M.R: Maybe in 2000-2001. I never had cash to buy one when it came out (and my parents never thought videogames are good for kids). -What are your favorite games on the system? S.F: For a long, long time it was the adventure Torico Gekka Mu Gen Tan (Lunacy for US readers), its beautiful music made the whole game for me. While I still like the game (and love its music) there's loads of others that came on my path which I fell in love with. Dezaemon 2 for its huge amount of options and the great deal of creativity I can unleash on it, Worms for its sheer addictiveness (TEN years after I bought it! ), Daytona CCE for the extremely cool link-up mode and Culdcept..boy what a game that is. Other games worthy of a mention; Sega Rally, Metal Slug, X-men vs Street Fighter, Keio 2, Greatest Nine / World series baseball, Gals Panic SS..
M.R: I don't have any favorite games as I didn't have time to play a lot. But I really like puzzle games and you have some really good ones on the Saturn. -What do you think is the most underrated game on the system? -and more so- its sequel. Both extremely enjoyable games if your persevere. Enemy Zero would've made the perfect example but I couldn't really get into it. I really feel games like Culdcept and Dezaemon 2 should've seen releases outside Japan. -Aaand the most dreadful one? S.F: It would be easy to bring up Death Crimson and Race Drivin' again, but it's time Seikai-Risshiden (a game so dull you'll start decomposing while playing it) and Isto E Zico (dodgy videos coupled with extremely poor designed interfaces) get the slagging they deserve. Oh and NHL All-star hockey (the first one). -Games you would've like to see on the Saturn? S.F: There's a lot of 'missed oppertunities' for the Sega Ages label. A Streets of Rage pack, a Golden Axe pack. I would've liked to see more 'Memorial selection' packs as well. More Dezeamon releases (especially the platform game creator one that was released on the PSX). Oh and anything sporting link-up compatibility, naturally. -What stuff do you collect at the moment? S.F: Mostly obscure or playable Japanese games (I try to steer clear of the 'girl adventures' for as long as possible), prototypes (not the easiest thing in the world, sadly), sampler/demo discs, magazines, promo items. -What items are you looking for? S.F: All kinds of Saturn prototypes / alpha's / betas. As for games; Wipeout XL, Sega Ages: Disney Mickey/Donald combo pack, Gun Griffon 2 link cable set. All are too expensive for my liking, so I'm just waiting to find them a bit cheaper. Also all items I actively collect (see above). -The best bits in your Saturn collection? M.R: My collection as a lot. S.F: Fighting Force has a big history for me but I'm mostly looking forward to a prototype with link-up functions, as silly as that may sound. Potentential candidates for that would be Syndicate Wars, F1 or early versions of Independence Day or Duke Nukem 3D. M.R: None really, unless some are complete and playable. -What do you think of the PSX as a system? S.F: Total garbage. Nah, only kidding. While I really dislike the overall design of the system and its clunky pads, its insides made it the success story it was. It certainly has a good amount of quality games but most of the ones I personally like(d) are also available on the Saturn (Wipeout 2097, Command & Conquer, Worms, Mortal Kombat trilogy, Destruction Derby..even while the Saturn version of that one stinks). The games I wanted to play at the time were Sega Rally, Daytona USA, Virtua Cop, Fighting Vipers and Bug!. There was no real need to buy a PSX for games like Ridge Racer, Toshinden or Time Crisis with games like that around. I actually own the system but it rarely comes out of the closet. It's only when a friend drops by for some link-up matches of Formula one or Destruction Derby it's of any use to me. M.R: The PSX is a good system with a shitload of games, but the hardware is too cheap and breaks easily. -Any interesting Saturn tidbits/stories to share? S.F: Yes, plenty. 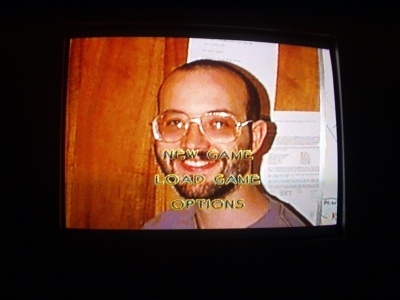 I once got a picture of Ezra Dreisbach (the main programmer) in Exhumed. Not sure how it got there, but it had something to do with a corrupted internal memory. Dutch midfielder 'Overmars' was amusingly renamed 'OverSaturn' when Silicon Dreams renamed all World League Soccer '98 players to keep out of copyright trouble. I did a pixel perfect Fantasy Zone 2 with Dezaemon 2 (only two levels and their bosses, mind). Oh and I got 220 volts running through me while messing around trying to get a prototype running. That was my lesson not to mistreat any Saturn system again.